This was a very close contender for my first week of fall picks! It practically screams cheers easy Saturday football food – to me. Ironically, it was my least-buffalo-loving daughter that got the recipe from my sister-in-law and brought it home to me. She prefers it tasting very little at all like buffalo, but don’t worry! I will show you how to take it either way – wimpy to wings-style. Clemson plays their first game on September 2nd and even though this didn’t quite make the cut for my fall favorites, it will still be on my plate come game day. It’s comforting mix of noodles, cheese, chicken and wing sauce will have you coming back for more. Much heartier than the popular buffalo chicken dip you often see at game day parties. 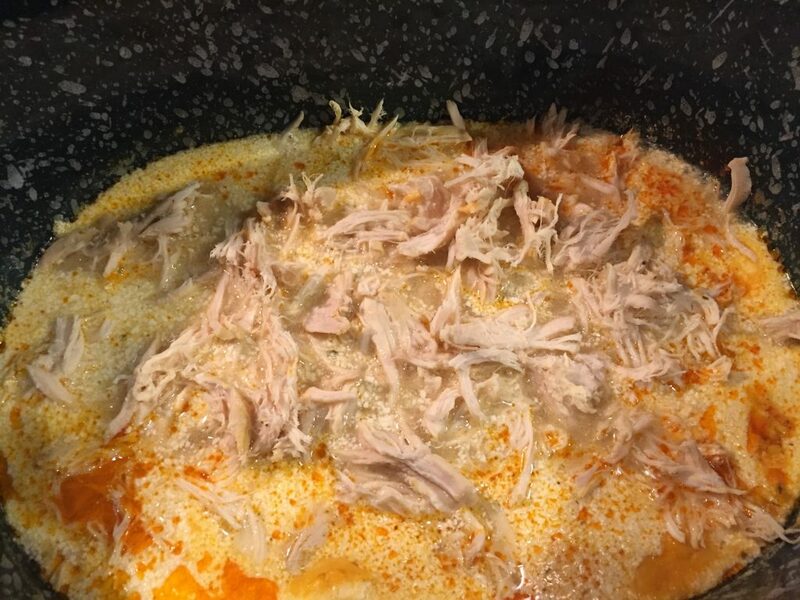 Easy to make and serve from the crockpot! *for wimpier tastes – use only 1/4 c. extra mild buffalo sauce (Texas Pete Extra Mild Wing Sauce). for medium taste add one additional 1/4 c. extra mild buffalo sauce before adding noodles at the end of the recipe. 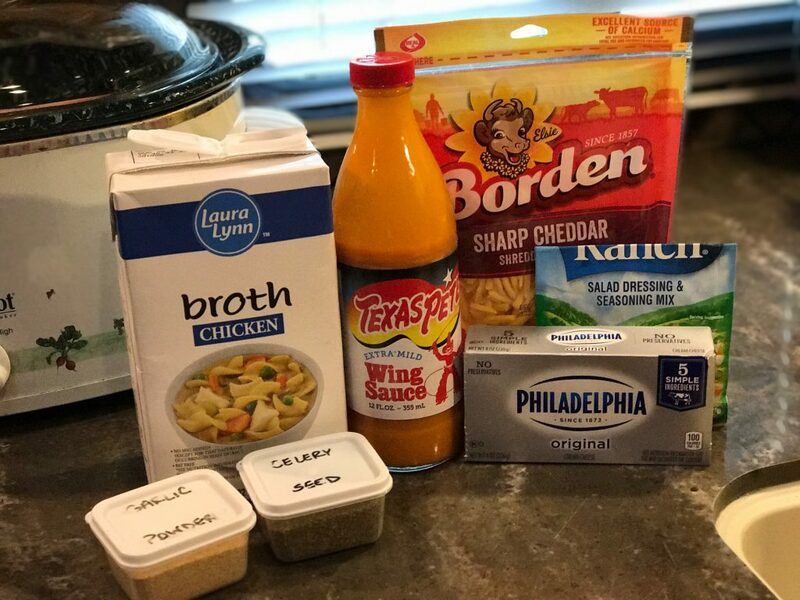 for those with real buffalo expectations add 1/4 – 1/2 c. regular buffalo wing sauce (Frank’s RedHot Wings Buffalo Sauce) instead of the extra mild sauce listed. No need to add both. Place chicken in the slow cooker. There’s the exciting chicken picture I knew that I took for you! Add broth, wing sauce (check note for desired heat level), ranch mix, garlic powder, celery seed, salt and pepper to the chicken. 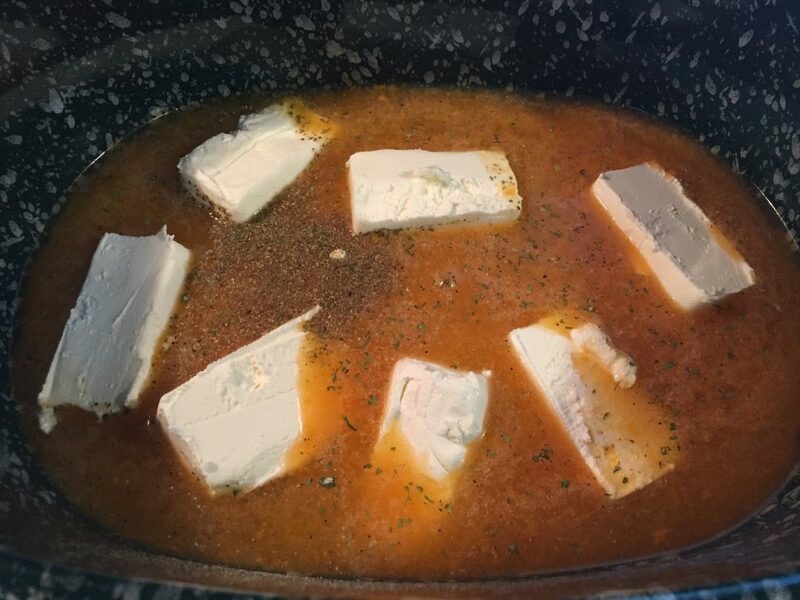 Cut up the cream cheese into cubes or slices and place over the chicken. Cover with lid. Cook on low for 8 hours. Remove chicken from the slow cooker and shred on a cutting board. Put the shredded chicken back in and stir. 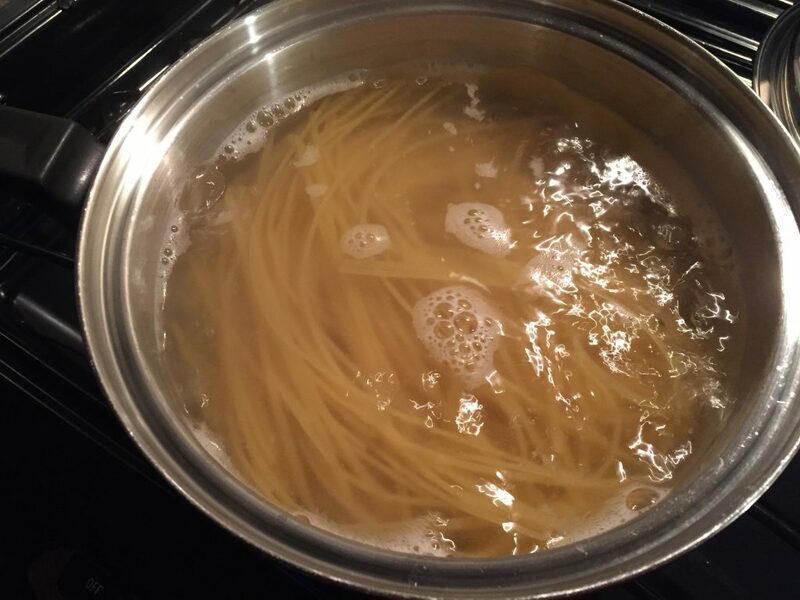 Prepare linguine according to package directions in boiling water in a pot on the stove. Drain the noodles and add them to the chicken mixture. The cheese sauce will thicken as it sits. At this point, you can turn the cooker off and serve. 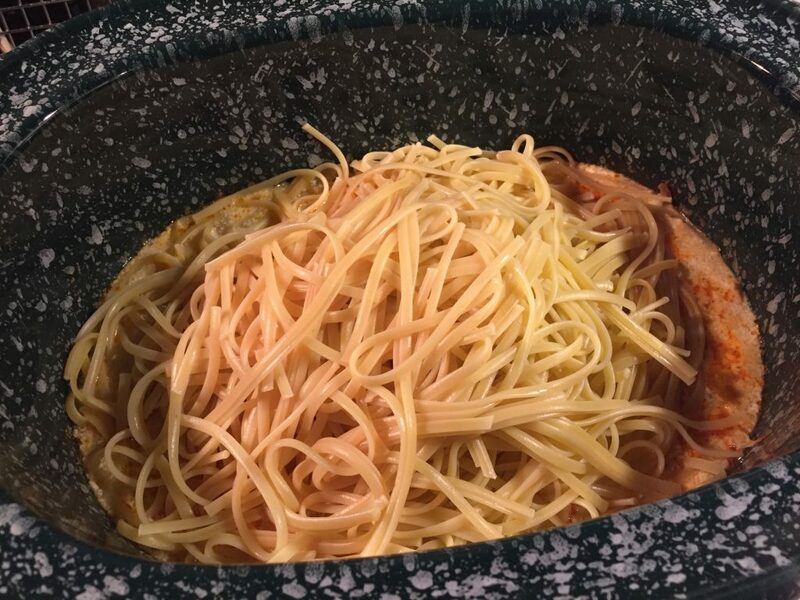 Or you can refrigerate the pasta and reheat the next day – adding a little water if the sauce becomes too thick. 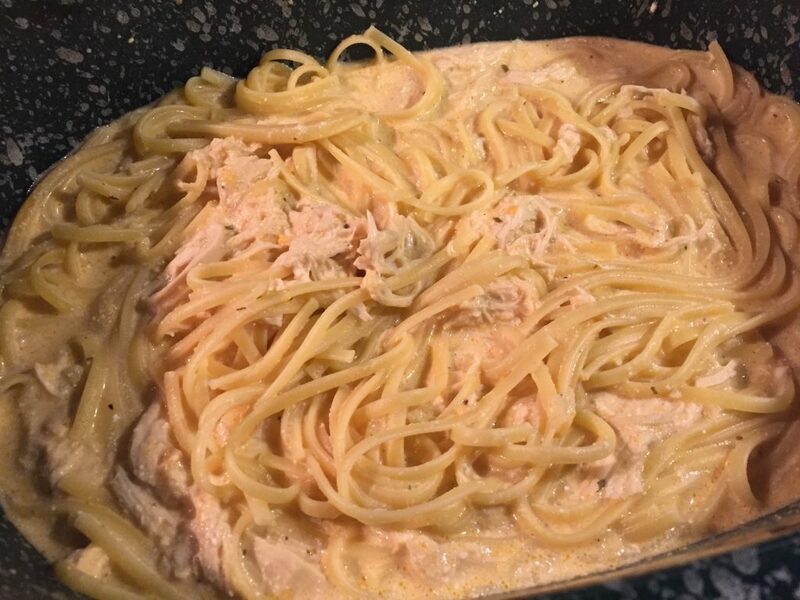 I’ve found that I prefer this recipe with slightly less than one pound of chicken and slightly less than one box of linguine because I like the extra sauce. 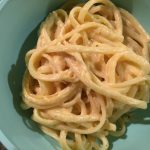 You might like to start with this recipe and then tweak it slightly until you find your perfect ratio of cheese to noodles to chicken. *For wimpier tastes – use only 1/4 c. extra mild buffalo sauce (Texas Pete Extra Mild Wing Sauce). For medium taste add one additional 1/4 c. extra mild buffalo sauce before adding noodles at the end of the recipe. For those with real buffalo expectations, add 1/4 – 1/2 c. regular buffalo wing sauce (Frank’s RedHot Wings Buffalo Sauce) instead of the extra mild sauce listed. No need to add both. If you are serving at a game day party, I would make it mild or medium heat and leave the real Frank’s RedHot for those who want to spice it up! Place chicken in the slow cooker. 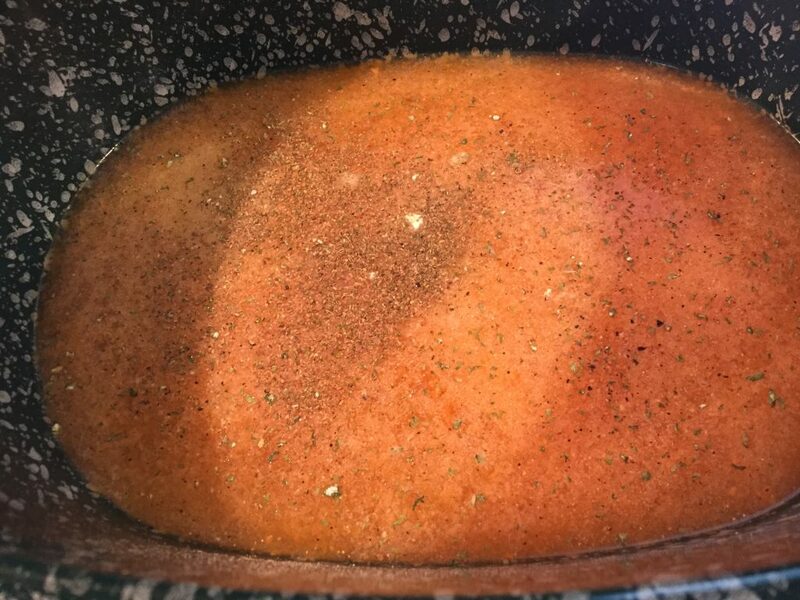 Add broth, wing sauce (check note for desired heat level), ranch mix, garlic powder, celery seed, salt and pepper to the chicken. Cut up the cream cheese into cubes and place over the chicken. Sprinkle the shredded cheese on top. Cover with lid. Bake in slow cooker on low for 8 hours (or on high for 4 hours if you are in a hurry). 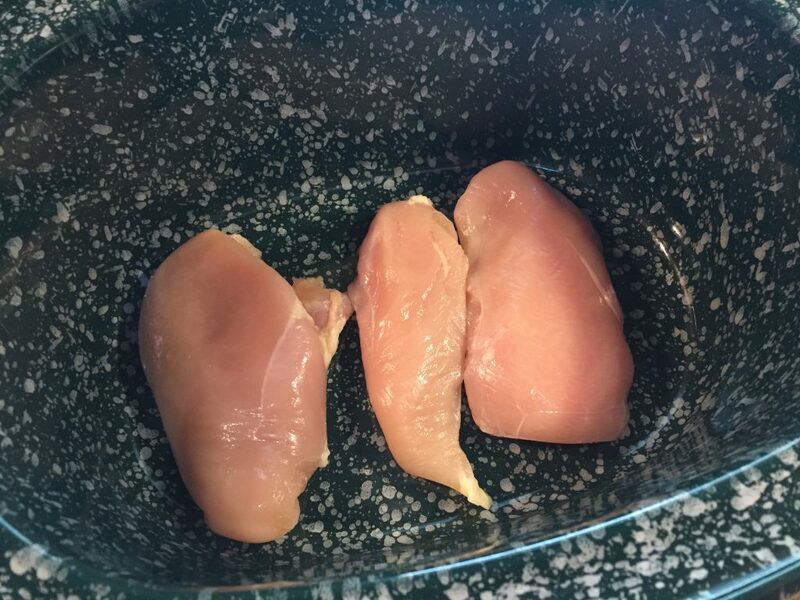 Remove chicken from the slow cooker and shred on a cutting board, removing any fat as you go. 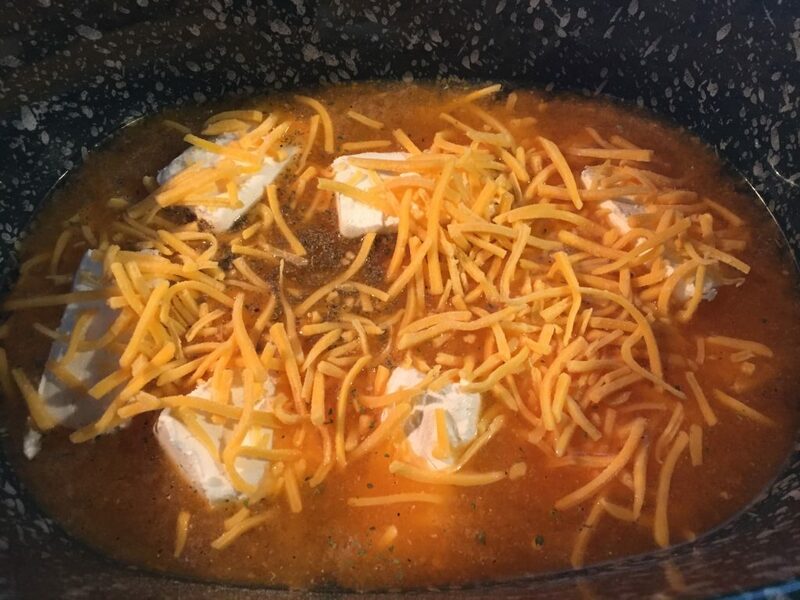 Stir or whisk the liquid and cheese in the slow cooker. Put the shredded chicken back in and stir. Prepare linguine according to package directions in boiling water in a pot on the stove. Drain the noodles and add them to the chicken mixture. The cheese sauce will thicken as it sits. At this point, you can turn the cooker off and serve. 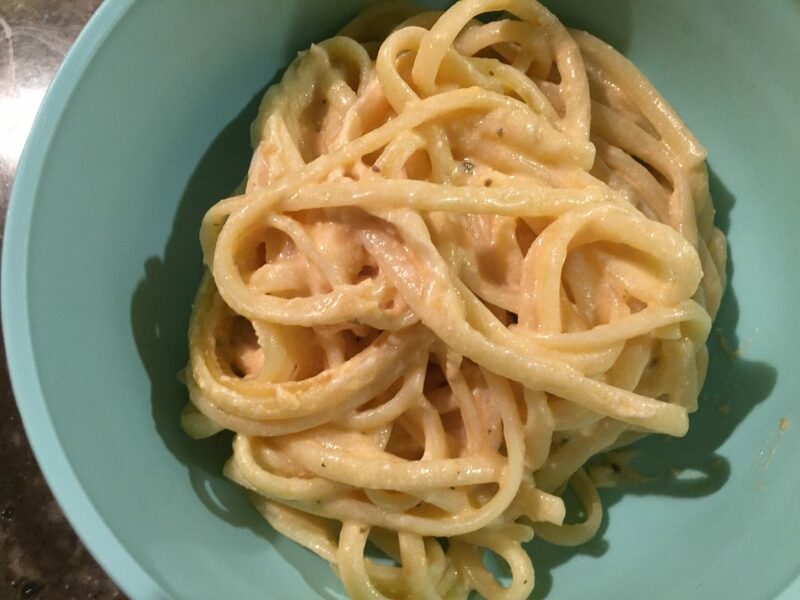 Or you can refrigerate the pasta and reheat the next day – adding a little water if the sauce becomes too thick. Don’t let the length of time on this recipe or the ingredient list intimidate you. It really is a very easy dish. Put several things in the slow cooker and walk away. Then at the last minute, shred the chicken and boil some pasta and you are done. If you want to, make it all in advance.